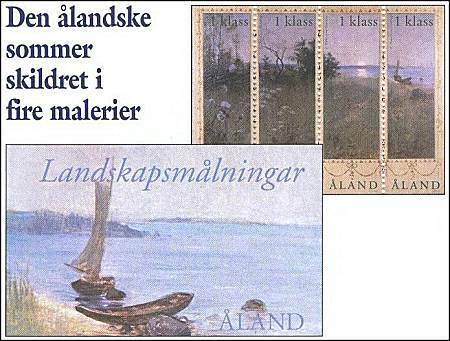 On 28th March 2003 Aland will release a booklet containing four paintings, depicting the summer in Aland. During the period 1886-1914 there was on Aland an artists' colony, called the Önningeby-colony. One of its members was the Finnish painter Elin Danielson-Gambogi (1861-1919). Her painting "Summer Landscape", shown on the four se-tenant stamps, was painted in Önningeby 1890. The full size of the painting is 156 x 206 cm. In 1898 the artist moved to Italy, where she married the Italian painter Rafaello Gambogi. She only rarely revisited her native Finland. The original painting belongs to the Aland-Bank. The four stamps are NVI "1st Class". The price of the booklet containing 4 stamps is 4,40 Euro. In 1986 another painting by a member of this colony, Victor Westerholm, "View of Önningeby", was issued on a stamp, Scott # 25, Michel # 19. Preview scanned from the Danish philatelic magazine "The Stamp Collector", 1/2003.